What is the difference between University and College in Canada? more hands on training and generally provide a Certificate or Diploma at the end of your studies. Moreover, Colleges tend to have shorter programs – a Degree in a Canadian University can take 4 years but a Diploma at College can take only 2 years. Most Colleges also provide pre-trades, pre-apprenticeship and language training. Universities are focused on professional programs and grant Degrees as opposed to diplomas. Professional programs include Medicine, Dentistry, and Law. They also provide “Honours” degrees which will allow you to pursue Graduate studies. More importantly, Universities focus on theoretical learning as opposed to practical experience. University graduates in Canada also make more money, this is because Doctors and Lawyers make considerably more than the average trades or College graduate. 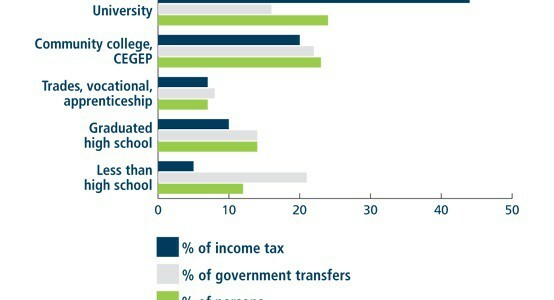 In Ontario, a University graduate makes approximately 35% more than those with a College Diploma. 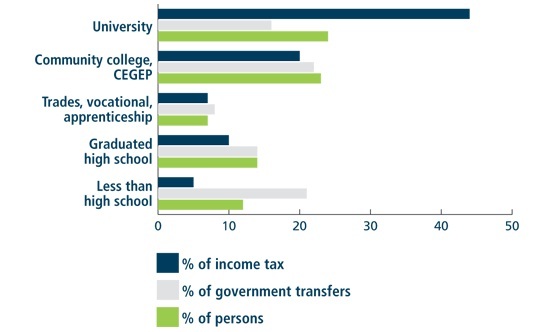 As you can see below University Graduates represent 27% of the Canadian workforce yet they contribute more than 40% of the tax base.